Here's a great enhancement on a well known, easy magic trick. If you already know how to perform the "Magnetic Pencil", you'll discover that this is a powerful follow up. After showing that a pencil sticks to your hand as you grasp your wrist, you suddenly let go of your "grabbing" hand and the pencil mysteriously stays in place. Learn the Magnetic Pen by watching our video here. For more video magic lessons, please subscribe to our video channel. To learn more levitation magic tricks, click here. And if you want to learn a way to defy gravity with cards, check out another related easy magic trick called The Floating or Levitating Playing Card, which you can learn here. There's also a similar easy trick (effect) with playing cards called the "Magnetic Hand," which you can learn here. Preparation: Put on the wristwatch and then insert the end of one pencil under the watch band on the palm side of your hand. The pencil should extend to about the middle of your hand. To perform the trick, instead of placing your finger underneath the pencil to hold it as you did in the easier version, you'll be slipping the end of the first pencil underneath the second pencil to support it. The first pencil that's under the watch is what keeps the first pencil in place underneath your hand. With the new setup, perform the "Magnetic Pencil" according to the trick instructions. Rest the second pencil on a table. Grab your wrist with one hand. Your other hand reaches from underneath to grasp your wrist. Bring down your hand, palm down, to rest on top of the pencil. As you bring your hand down, extend the tip of first pencil that’s connected to your wrist watch under the second pencil that's resting on the table. You can now lift your hand and the second pencil will appear to stick to your hand. Notice that you still display the discrepancy of three fingers gripping your wrist. This will throw off those who know the trick. Suddenly let go of your grabbing hand and the second pencil stays in place. Bring your hand down onto the table and as you come down, slip the pencil out from under the other pencil to release it. Take your hand away as you display the pencil on the table. While I would normally never encourage any of you to expose the secret to a magic trick, this "follow-up" effect offers the opportunity to expose one effect, the magnetic pencil (referenced earlier in these instructions), and then create a second, more powerful effect that defies explanation. 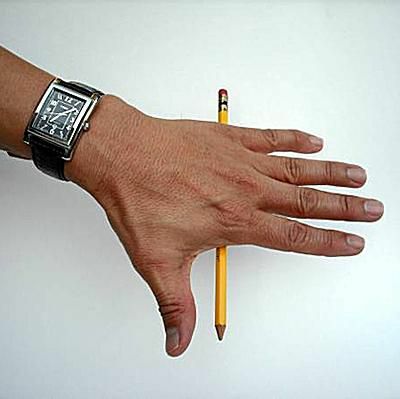 To do this, perform the first effect where you are using your finger to support the pencil and then show the spectators how you are doing this. As they laugh at how they have been fooled, slip the second pencil under your watch and get ready to perform the second version. Tell the spectators that you'll perform the trick again but rely on the second pencil that's under your watch to support the pencil that spectators see. Go through the motions as you did in the first trick to hold your wrist with your hand - but the pencil is actually supported by your watch. Slowly release your hand from your wrist and the spectators will be very surprised to see it stuck to your hand with seemingly no support. Needless to say, don't expose the method in the second phase. A good accompanying trick to this one is "The Rubber Pencil." Click here to learn this trick. You can follow this trick with a levitating trick that includes: "The Levitating Pencil" (click here to learn the trick) and "The Levitating Ring". As the trick titles imply, in "The Levitating Pencil," a pencil that's placed into a bottle and appears to levitate up. And in "The Levitating Ring," a finger ring, which can be borrowed, is placed onto a pencil and it mysteriously floats up. Keep in mind that you don't have to do these tricks with a pencil. You can use a pen. And if you have one, you can use a magic wand. You can read a collection of tricks with pencils and wands here.